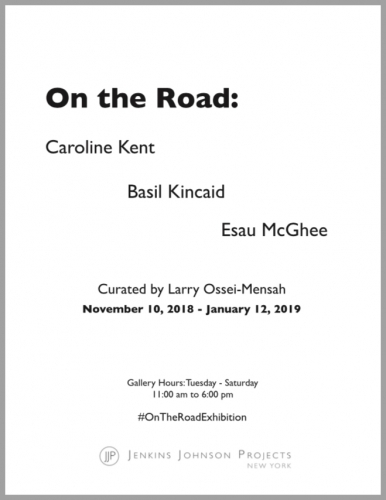 The Exhibition Guide for On The Road: Caroline Kent, Basil Kincaid, Esau McGhee contains an article from the Curator, Larry Ossei-Mensah as well as an article from Lucy Mensah, Curator and Visiting Assistant Professor at the University of Illinois, Chicago. Selection from Lucy Mensah's article The Whole World in a Frame: Situating Place in Contemporary Art-Making. CONTINUE READING AND DOWNLOAD EXHIBITION GUIDE HERE!